We know how important finding the right instrument is. When you are trying to create a signature sound coming close won’t do. It has to be just right. Whether it is a germanium fuzz pedal or a Native American flute, that perfect instrument is out there and we want to help you find it. That is why when we buy, sell and trade musical instruments and accessories we make variety a priority. From folk band to school band to rock band, come in and browse our offerings. Live acoustic and folk music represents the collective voice of the common man. The tradition of passing along songs is shared across all cultures and is at the heart of the way we maintain culture through storytelling. While some have elevated the genre to highly stylized and polished performance and recordings, we feel that you should pick up any of these instruments and play the music in your heart. Early involvement in music has a positive impact on all areas of life, including self-discipline, coordination, and personal expression. If you are looking for the right instrument for your child, we carry many instruments that are played in the schools. Screw the man and form your own band! Now you have the instrument but what about those final components to make it complete? Not to worry, we also carry accessories. Our musical instrument sections are an ever-expanding haven for musicians. Give us a call and we will check stock to see if we have what you’re looking for. Don’t stop at musical instruments. Bookmans also carries movies, video games and hardware, comics, magazines, housewares and, of course, books! If you want to discover something new, ask us for a recommendation. If you are ready to trade in an instrument from your personal collection, bring it in and one of our instrument aficionados will see if it is something we need. Stop by any of our six locations in Arizona and prepare to be amazed. Bookmans is a Buy, Sell, Trade store. You can bring in your old and gently used books, CDs, DVDs, instruments and housewares to receive Bookmans trade credit or cash. Come in see all that Bookmans has to offer from our wide range of reading material to our cult movie section to our rad staff and their sparkling personalities. * Bookmans cannot guarantee stock. If there is a particular instrument you are looking for give your local Bookmans a call and a staff member will be happy to assist you. Do you have any dulcimer? We often do have dulcimers, but I don’t know if the Bookmans nearest you has one. We don’t have an electronic inventory to track musical instruments. Please feel free to call your store directly or you could also e-mail your request (please allow additional time for e-mail responses). Do you have any used lefthanded Telecaster guitars? Hey Mark, I sure hope we do. Unfortunately, we don’t have an electronic inventory, so I don’t know if our stores have one. If you contact a store directly, they will check their shelves for you. 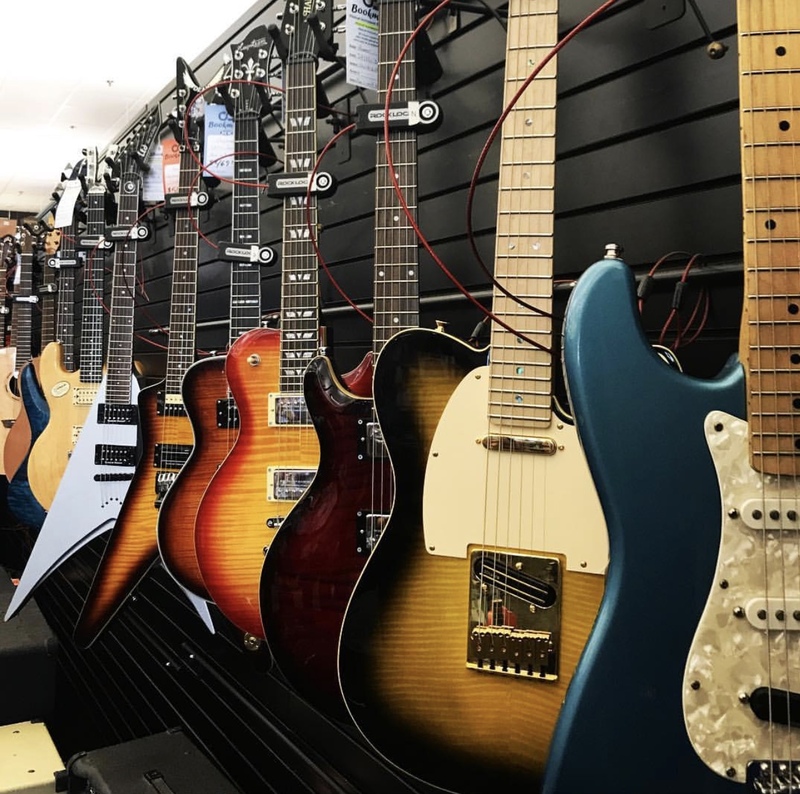 You can also contact our musical instrument repair shop to see if they know of any about to go onto the sales floor and if so they will be able to transfer the guitar to the Bookmans location of your choice. Would you happen to have any USB interfsces? Hey there! Your best bet is to call your local/nearest Bookmans. All of the stores vary in what they carry and buy/sell/trade, but any one of the awesome people can browse the store and check to see if a particular location has a USB interface for sale. Hope this helps! Do you tune classical guitars? If so, what do you charge? Do you have any accoustic guitars with pick up and eq in it? Looking for an accoustic I can plug into an amp. Do you have any ukulele’s? Hi I wanted to know if you have any drum kits for sale. The best thing for you to do will be to call your local Bookmans – unfortunately we do not maintain a digital inventory for me to look into that for you. For both your buying and selling questions you will need to contact your local store directly to see if they have what you’re looking for in stock (as we do not maintain a digital inventory) and to see if they can provide you any sort of quote as we can’t online and there’s no guarantee that they will be able to give you more information than I can until they see the guitar in person. So sorry. The stores info can be found at bookmans.com/stores. Do you guys offer a lay-a-way plans on your iinstruments? I’m looking to purchase a saxophone soon. Hi Billyboy, we don’t offer layaway plans, but you can use trade credit to buy anything in our stores. Consider trading in some of your books, music movies and more to put trade credit towards your purchase of the saxophone. Here is more info about the trading process: http://bookmans.com/about/buy-sell-trade-at-bookmans/ Please let us know if you have any further questions. Hi Scott, we do repair bows. The repair would cost $45-60. Unless the bow is a really nice one that you would want to hold on to, it might be best to purchase a new one, which we do sell in stores. Thanks for reaching out! am looking for quality USA made ukes? Thank you for reaching out, Mick! We welcome comments so that we can communicate with our customers all around the state (and beyond.) When it comes to store inventory, it is always better to call your nearest Bookmans location, the directory is bookmans.com/stores. We don’t have a digital inventory, so your local store will know exactly what’s in stock. We also offer the option of calling any store and requesting that a product be transferred to your local Bookmans so that you can pick it up. Please feel free to contact me with any other questions at katys@bookmans.com. Thank you! am reading past posts ….. what is this posting section for …. all answers say to call the store ??????? My son at school is learning Viola, do you have this instrument for rent. Hi, Ileana! We don’t rent instruments, but you can use trade credit to buy anything in our stores. Consider trading in some of your books, music movies and more to put trade credit towards your purchase of the viola. Also, each store has a Musical Instrument Manager and you can call to check if your local store has a viola in stock. The directory of stores is here: bookmans.com/stores. Here is more info about the trading process: bookmans.com/about/buy-sell-trade-at-bookmans/ Please let us know if you have any further questions. Hi, Kate! We do carry many of the musical instruments that you mentioned. Our stock changes from day to day due to the nature of our trade model. The best way to check to see what our stores currently have is to give your local Bookmans location a call. The store directory can be found at bookmans.com/stores. Thanks! Do you buy guitars with only 3 strings? thank you! Bookmans loves musical instruments (even those that have three strings! ), but the only way to see if your local Bookmans is interested in your particular guitar is to take it into the store’s trade counter or to give them a call and ask them if they would like to take a look at it. Thanks! Since each Bookmans store monitors its own inventory and decides which items is it accepting, you would have to call your local store/s to ask if they are interested in the Rockband Harmonix guitars and Wii wheels or you can bring them in and have a Bookmans buyer take a look. Thanks! Do you have any autoharps currently in stock and what is their cost please? Hello Anna! Unfortunately, we do not have an online inventory, but we do generally carry autoharps at our stores. For a stock check and a price quote, visit your local Bookmans or give them a call. Our staff can check inventory, price, and sometimes even hold items until you can pick them up. All store phone numbers and addresses can be found here: http://bookmans.com/stores/ and every store is open from 9 AM until 10 PM daily. Thanks! Hello, in search of Hang Drum.. As Native American Flute… Flagstaff area… But wiling to travel. Hello! We do not have an online inventory, but if you call Bookmans’ Flagstaff store at (928) 774-0005 they can check their stock and even hold an item for you until you can come in. Thanks for checking us out! Are the instruments at the store or online? Hello! We sell new, used, and refurbished instruments at our stores only. You can find our store addresses and phone numbers here http://bookmans.com/stores/, and every store is open from 9 AM until 10 PM daily. Thanks, and we hope that you find something great! Does every location usually have an amp? Hello Ben! We cannot guarantee that every location will have an amp for sale since every store’s inventory changes daily. The best thing to do would be to give your local Bookmans a call and ask before you head in. All Bookmans store phone numbers can be found here: http://bookmans.com/stores/. Thanks! how much are the vilons? do you have trumpets? Hello! You would have to call your local Bookmans store to inquire about their current musical instrument stock and prices. They may even be able to hold an item for you if it is in stock. All store phone numbers can be found here: http://bookmans.com/stores/ and all stores are open from 9 AM until 10 PM. Thanks! Hello Jen! Unfortunately, we do not have an online inventory, however, if you call your local Bookmans store they can check their stock for you and possibly hold an instrument for you as well. All store phone numbers and addresses can be found here: http://bookmans.com/stores/ Thanks! Do you have a viola chin rest at any bookman? Hello Susanne! Unfortunately, we do not have an online inventory. However, if you call your local Bookmans store they can check their stock for you and possibly hold one for you as well. All store phone numbers and addresses can be found here: http://bookmans.com/stores/ Thanks! Hello Al. Unfortunately, we do not have an online inventory. However, if you call your local Bookmans store they can check their stock for you to see if we have either. All store phone numbers and addresses can be found here: http://bookmans.com/stores/ Thanks!